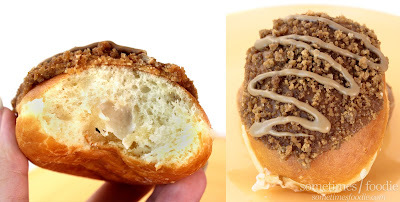 Sometimes Foodie: National Cream Filled Donut Day! - Krispy Kreme Fall Doughnut Reviews! National Cream Filled Donut Day! - Krispy Kreme Fall Doughnut Reviews! The glaze on the doughnut? Remind me of the glaze! Apparently it is National Kreme-filled Doughnut Day, so here we are! I picked these up after seeing a 30th anniversary screening of Labyrinth with my sister. On our way home we passed a Krispy Kreme and, well...we just couldn't resist. We got hot from the fryer glazed doughnuts and ate them in the parking lot. (Like the classy ladies we are.) Then I grabbed one each of the new fall doughnuts to review. I got one Pumpkin Spice, and one Salted Caramel Latte. I've got one minute left of National Kreme-filled Doughtnut Day to review them...so let's get this thing started! Pumpkin Spiced: The glazed coating has hardened into a slightly crisp sugar shell, while the doughnut underneath is soft and cake-y. It has a nice spiced flavor that's perfect for fall and would be great with a hot cup of coffee. 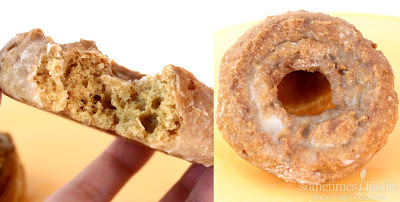 Admittedly, there are a lot of similar pumpkin spiced doughnuts like this out there, and it's not the absolute best one I've ever had, but it's pretty darn good for a fast food-style doughnut chain. Salted Caramel Latte Kreme-filled Doughnut: This one is more appropriate for the National holiday. (That no one but food bloggers and doughnut chains care about.) This doughnut is shell-style with an espresso-flavored kreme filling, caramel icing, salted caramel sugar blend, and an espresso drizzle. The doughnut is light and fluffy, like usual, and there's definitely a kreme filling...but it doesn't taste like espresso to me. it's more like instant coffee. 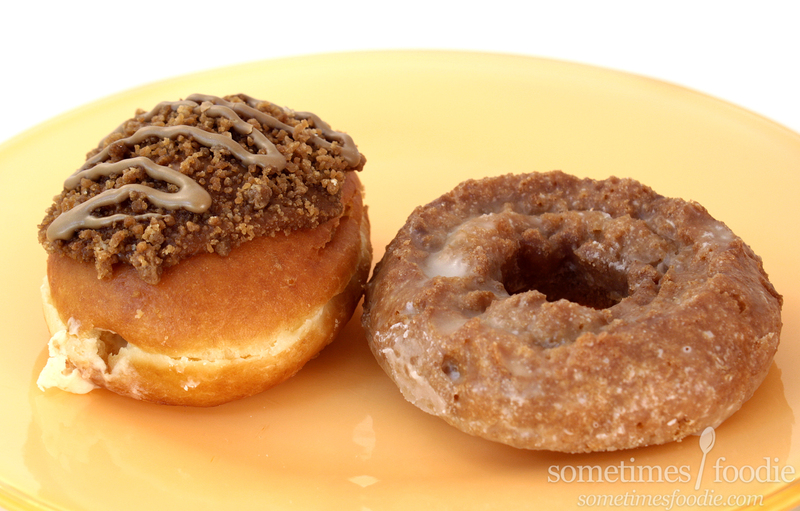 It's okay, but the real action is on top of the doughnut with the salted caramel sugar blend. It's sweet, salty, and buttery. I find the little crumbly bits really addicting and I like to pick them off and eat them separate. Then there's the espresso drizzle, which again is kinda "meh." I really like espresso, but even though this is marketed as a "latte" doughnut, the coffee/espresso aspect is really lacking. I like this one, but it was a bit too cloying for me. I ate half and felt like I needed to drink a glass of water to balance out all the salty sweetness. Both doughnuts were pretty yummy, but I ended up liking the pumpkin one more and of the two, that's the one I'd recommend. It's light, moist, cake-y, and a perfect companion to a hot beverage this fall. The creme-filled salted caramel latte is interesting, but too messy to eat on the go, and it's more salted caramel than latte.